Description: Indiana Railroad SD9043MAC 9007 trails on LCL2 South. Description: The Indiana Railroad SD9043MAC 9007 trails on LG1 South. Title: Just a hint of power at the yard in Jasonville, In. Title: INRD 9007 set ready for a job at Hiawatha Yard in Jasonville, In.. 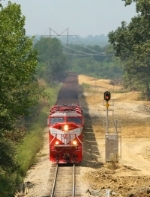 Description: INRD Northbound Coal Train passing through Linton, In. on their way to load at Switz City, In. Description: Power set included 2 SD9043ACs(IPL power), a UP yellow(CITX)/INRD red SD40-2 pair(yesterdays HWSA power), and another red SD40-2 pair(Richmond train power).